You're invited to take a leisurely stroll through the stunning Garden District of New Orleans. 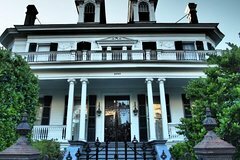 See the stomping grounds of authors, poets, movie stars, artists, and sports legends such as Anne Rice, John Goodman, and Archie Manning. Enjoy the towering Southern Live Oak trees, magnificent Crepe Myrtles, and the stunning Magnolias that some have said make walking through the neighborhood akin to walking through a fairy tale. Learn the deep and rich history of the area and how it fits into the overall story of New Orleans including the jealousy and mistrust that led to the 'new money' of the 'garish' Americans trying to show up the splendor and glory of the 'old money' Europeans on the other side of town. The tour also visits the oldest Municipal Cemetery in New Orleans, Lafayette #1, the site of filming for many famous movies and TV shows including Interview with a Vampire and Double Jeopardy. • Lafayette CemeteryThis is a 2-hour walking tour with a total distance of one and a half miles. The tour meets at Starbucks Coffee on the corner of Magazine Street and Washington Avenue.